Matson’s glamorous white passenger ships began service between San Francisco, Los Angeles and Honolulu in 1927, making the trip in a record five days. During World War II, the Navy requisitioned the four liners of the fleet: Lurline, Monterey, Mariposa and Matsonia, for use as troopships. Some of the fleet brought the Australian and New Zealand-born “war brides” to California to be reunited with their US servicemen husbands. In early April, 1946, The Matsonia became the first of the fleet to end her war duty and was turned back over Matson. The others would follow soon after. 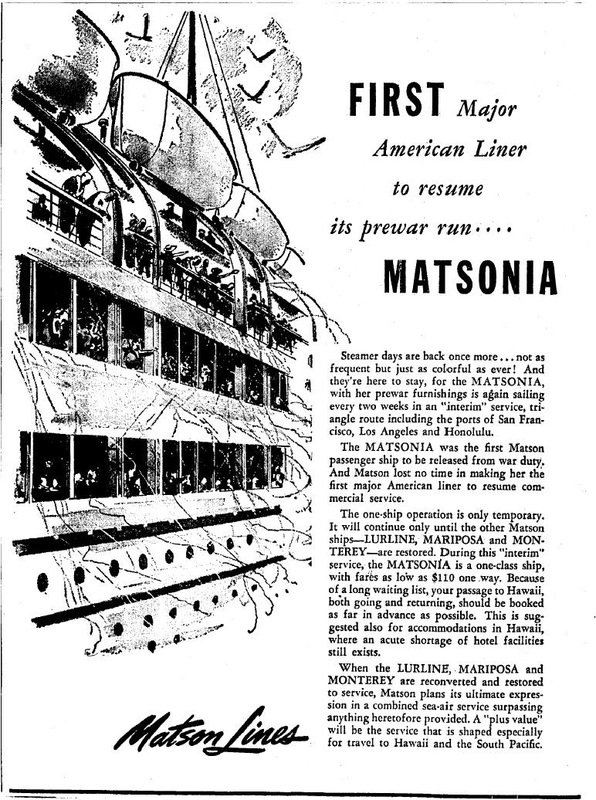 Matson estimated that Matsonia, the prewar Queen of the Line, had sailed some 355,000 miles and carried 176, 319 passengers, between December 7, 1941 and December 31, 1945. The company rushed to complete repairs and refurbishment for the ship, which, it was reported, was scheduled to make her first peacetime sailing between Los Angeles Harbor and Honolulu on May 24. The May 24 date turned out to be overly ambitious. It was not until August 1 that that the partly-reconverted Matsonia arrived in Los Angeles from San Francisco en route to Honolulu. Though still painted a battleship gray, the event had the atmosphere of a maiden voyage. 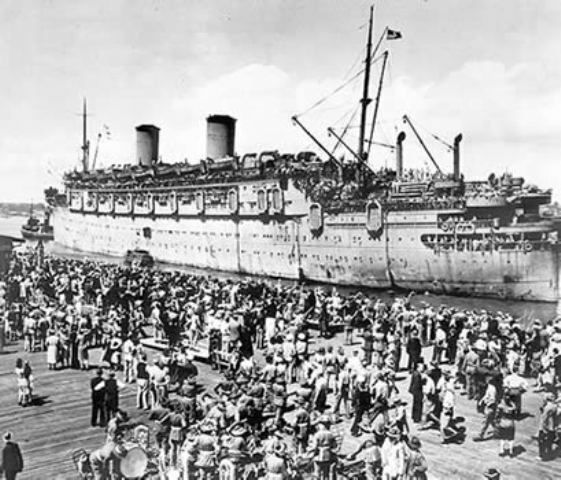 The ship was open to the public during the day while at L.A. Harbor, and some of the 547 passengers had stateroom parties before setting sail at 5 p.m. 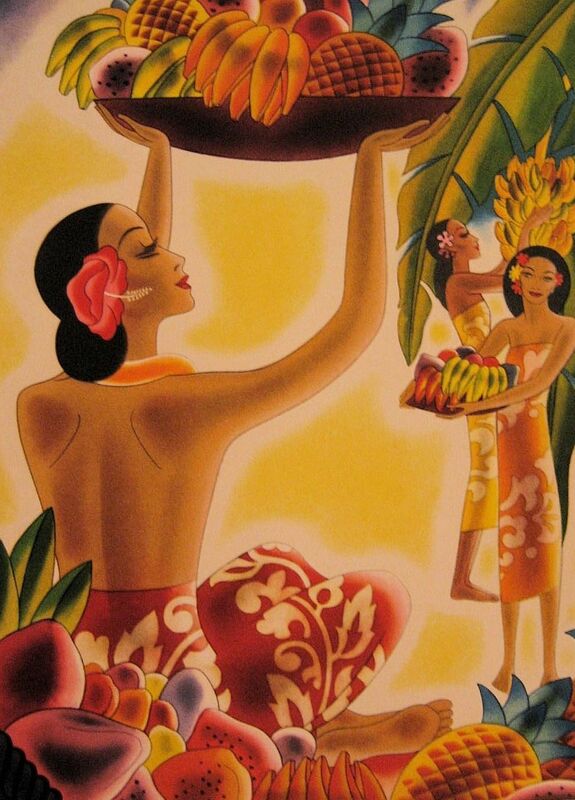 Many a Los Angeles resident saved the menu covers like this one from their postwar Matson liner voyages, to be preserved in bamboo frames and displayed in rattan-furnished “Florida” rooms. A week later, Mariposa, though still outfitted as a troop transport, left San Francisco for its first postwar civilian voyage to Honolulu with 900 aboard. In early September, she began reconversion and refurbishment at Matson’s Bay Area dry dock facilities. Also in September, the Monterey carried returning troops and U.S. servicemen’s “war brides” from Japan to the West Coast, prior to beginning her refurbishment. Lurline also underwent reconversion, which was completed by the end of the year.